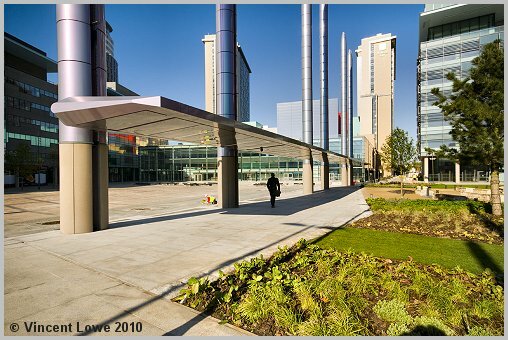 MediaCityUK is a 0.82km² (200-acre) property development based on the media industry, located in Salford Quays. MediaCityUK is being developed by a partnership of the Central Salford Urban Regeneration Company, Peel Holdings and Salford City Council. The main tenant upon initial completion will be the BBC at its new 12,500m² BBC Centre. The development has an unusual feature in that the streets do not bear any names but instead are identified by colours alone. The address of the BBC is, for example, "Blue". The BBC will be moving five of its departments to the development, including BBC Children's, BBC Learning, BBC Sport, Radio Five Live, BBC Breakfast, and parts of BBC Future Media and Technology (including a small number from BBC R&D), involving about 2,300 staff. Also, BBC North West will relocate to the site from its current premises in Oxford Road, Manchester. Other tenants include Salford University, a Holiday Inn, and the Number One and 'The Heart' apartment blocks. These photographs were taken on the day after the public piazza area opened for the first time.